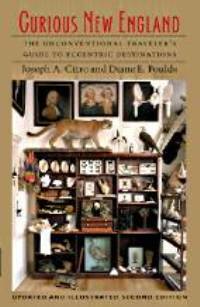 Curious New England, by Joseph A. Citro and Diane E. Foulds, 2003. "The Unconventional Traveler's Guide to Eccentric Destinations" A collection of hundreds of oddball attractions across the region, from small, obscure museums to bizarre roadside curiousities far off the beaten track. Directions, hours, etc. are given for each site. 334 pp, 5 1/2" x 8 1/2".